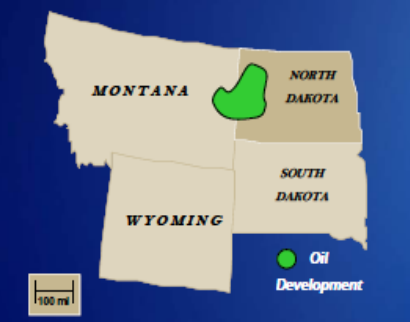 The Bakken shale oil play is located within the Williston Basin in Montana and North Dakota. While the shale extends into the Canadian provinces of Manitoba and Saskatchewan, only the United States portion is considered in this evaluation. This oil field could contain 3.65 billion barrels, which would be the largest finding in U.S history. Based on the leaseholders combined net acreage for Bakken, the area is approximately 6,522 square miles in the United States. The shale oil play has an average EUR of 550 MBO per well and approximately 3.59 Bbl of technically recoverable oil. The Bakken shale ranges from 4,500 to 7,500 feet deep with a mean of 6,000 feet and an average thickness of 22 feet. According to Kodiak Oil and Gas Corporation and other companies, the well spacing ranges from 320 to 1,280 acres per well with a mean of 640 acres per well (1 well per square mile). Other average properties were estimated for the Bakken shale play. These include the depth (6,000 ft.), thickness (22 ft), porosity (8%) and initial oil saturation (68%) for the shale. There are over a dozen companies with leases within the Bakken oil shale play, these companies have leased a combined total of 4,174,625 acres (6,522 sq. miles). 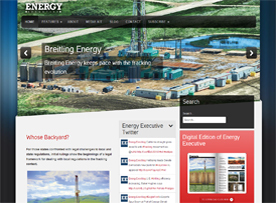 There are extensive activities within the Bakken shale play. Nearly all of the reported leaseholders have given information about their 2010 development plans. Companies are running at least 45 rigs in 2010 and have indicated that number will increase to more than 54. Of these, 14 are operated by Continental Resources, 12 by EOG Resources, and 5 by Marathon Oil Corporation. 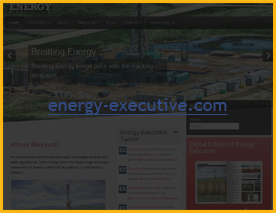 In addition, many of the companies have significant capital programs devoted to the Bakken shale. Kodiak Oil and Gas Corporation has stated they plan to spend $60 millions dollars, Oasis will spend $144 million dollars in the West Williston Basin, and Whiting Petroleum Corporation will spend $284 million dollars for operations in the Sanish and Parshall sections of the Bakken shale play. Well costs range form $5.5 to $8.5 million dollars. The vast majority of the companies that provide data have costs less than $7.2 million dollars. Whiting Petroleum Corporation and Marathon Oil Corporation also report the lowest price, $5.5 million dollars. In addition, Marathon Oil Corporation reports operating costs are less than $5 per barrel in the Bakken play. In 2008, USGS conducted an assessment of the Bakken shale. The total undiscovered resource is estimated between 3,063 and 4,319 MMOE, with a mean at 3,645 MMBO of total continuous resources.